KIEV — Ukrainian police cleared an encampment on Kiev’s main square Friday morning when tax protesters refused to leave after the parliament approved a compromise proposed by President Viktor Yanukovych. Protesters, mostly self-employed workers, were not satisfied with amendments to the new tax code and rallied into the night, demanding that Yanukovych veto the legislation, said Serhiy Fisun, a spokesman for the demonstrators. About 200 people stayed in the camp after the vote. 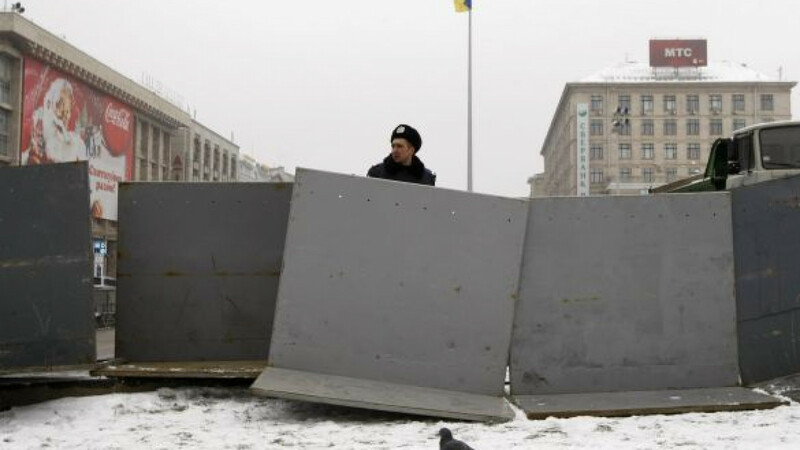 Berkut, the special police of Ukraine’s security forces, removed tents, a stage and speakers at 5 a.m. Officers acted on a court order to clean up the square, said Volodymyr Polishchuk, a spokesman for the Kiev police, in televised remarks. A Christmas tree is being installed at the location. Protests in Kiev and other Ukrainian cities started Nov. 16 as the parliament began discussing the tax code proposed by the government of Prime Minister. Thousands of self-employed workers, who make up 19 percent of the work force, staged rallies saying the code would limit their ability to qualify for a flat tax. Lawmakers on Thursday approved Yanukovych’s proposal to retain a simplified tax system for small entrepreneurs. Yanukovych said Nov. 29 that he would consider the demands of small and medium-sized businesses. The government needs the tax code approved to ensure revenue for the 2011 budget, which must have a deficit equal to no more than 3.5 percent of gross domestic product to comply with International Monetary Fund demands.